Learning takes place in quaint wilderness! DIFFICULTIES STRENGTHEN THE MIND AS LABOUR DOES THE BODY.Through this blog post, I am going to tell you a story of four young boys, their individual struggles and situations that led them to come together for a common purpose i.e. ‘to rise up in life’. This story takes off from ‘Hunnar Gurukul’ an artisan training school; located in a quaint village named Uttur, in Kolhapur district of Maharashtra. Situated by Kolhapur-Panjim highway, Uttur is fabulously spoilt by lush green trees and a wilderness that brings in positive vibes about nature’s undeterred bounty. I had visited Uttur in March 2019, to review the year-long skilling program. The temperatures had just begun soaring yet there was tranquility in the air and a deep sense of quietude which is necessary for holistic learning to prevail. Hunnar Gurukul is an initiative of ‘Cause to Connect Foundation’, a Pune based NGO established in the year 2016, supported and nurtured by Lend A Hand India. Mr. Aniruddha Bansod, a passionate professional leads it. Academic year 2018-19, was the first year of its project implementation. The first batch of students at Hunnar Gurukul consisted of eight boys who had not fared well in the formal education system but had an inherent aptitude for artistry. Through its one year course, the Gurukul had addressed their capacity gap between formal education and vocational skill training and saved these individuals from turning into migrant laborers. As the name suggests, Hunnar Gurukul is a residential program implemented through a well designed time table which includes activities for physical, personal and spiritual1 growth for the students. Hunnar Gurukul imparts year-long practical vocational skill training in carpentry and masonry. Each session lasts for twelve months and the course is split into three parts i.e. – four months of concept based practical training, three months of production where students make real life usable models by applying the skills learnt in workshop and the last three months of on job training with a domain specialist. Upon completion of course, students are encouraged to explore options of placements and/or entrepreneurship. The Gurukul handholds its students in getting their first work/job orders in place. Leaving behind the nitty-gritty of training and its components, which are otherwise available through reports and statistics, I concentrated on stories at the Gurukul. As of March 2019; Gautam, is a gritty 17 year old, newest entrant into the Hunnar Gurukul. About 2 years ago Gautam used to beg at Kurla railway station in Mumbai. Physical abuse, hunger, destitution, helplessness, he had experienced it all in most horrible proportions and in great detail. He was rescued from that fearful existence by Snehalaya, an Ahmednagar based NGO. At Snehalaya he was clothed, sheltered and given a new identify, but educating him was a challenge because of his age and no prior background in formal education. To make sure that he wouldn’t fall back into the vicious circle of helplessness, he was brought in at Hunnar Gurukul to receive vocational skill training over mere literacy. Gautam is a student of carpentry. His trainer says that Gautam speaks very less, is shy by nature but an avid learner. During an in-depth interview with Gautam, I found that he had experienced the greatest amount of trust deficit in his earlier life at Mumbai and hence remained isolated in the beginning. As time progressed, the positive learning environment, individual attention and care at Hunnar Gurukul helped him heal his past scars and open up to cheerfulness. On the day of the visit, after classes in the evening the boys had presented a song and dance program to express their happiness about having a visitor in their campus. Gautam had anchored that program with limited words but excitement that oozed out of his sincere eyes. Gautam’s case is a strong example of vocational education as an instrument for nurturing, healing and moving up towards better life conditions. Three 18-21 year old boys, Rohan, Rohit and Rishi; slightly senior students of carpentry, were on the verge of completing their course at the time of writing this story. Having spent their childhood at Snehalaya, destiny had brought all three of them together for livelihood based vocational skill training at Hunnar Gurukul. They know nothing as to who their biological fathers were, all they know is that their biological mothers were into professions that ‘society would not accept’2 and hence they had been sent away by their own mothers to the shelter home at Snehalaya for a better life. As per their trainer, all the three boys have been exceptionally good students and have taken deep interest in learning and allied activities throughout their stay at the gurukul. During the visit I had an informal conversation with them to find out more about their well being and present state of mind. Through the conversation they shared that, at that point of time they were doing their internship with an architect near Velhe block in Pune district. They also said that after completing their internship they would like to set up a small production shed and take basic job orders. Over and above getting details about their progress in training, I observed that something more than livelihood preparedness had developed between the three of them. I found that from being erstwhile orphans they had started living like brothers, they had become a family with the same dreams and aspirations. This was far much over and above the intended impact of both formal education as well as vocational skill education. Having spent a complete day with the first batch students of Hunnar Gurukul; that evening as I left Uttur, I couldn’t help but wonder about the miracles that can be achieved if ‘education is imparted as service of the greatest order, accepted as gratitude and revered as worship’. 1spiritual here means the specific quest present in human beings that makes them seek a better living than the present and a spirit to fight in the face of adversity. It is in no way related to religion. It refers to the drive or eagerness in a human being to excel in a particular task/work/activity. Names of students have been changed to protect identity. Posted byLend A Hand India April 15, 2019 April 16, 2019 Posted inUncategorizedLeave a comment on Learning takes place in quaint wilderness! Multi Skill Foundation Course opens job opportunity for Girls in Elevator Industry!! 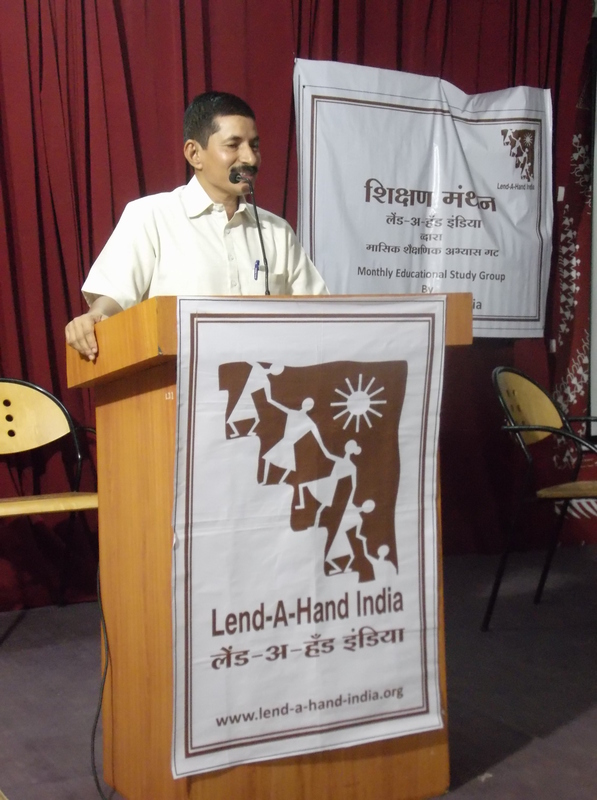 Lend-A-Hand-India has become a pioneer in scaling up vocational education at higher and secondary schools. Having a strong belief in the untapped potential of adolescence, both in rural and urban schools. Multi Skill Foundation Course (MSFC) provides a platform to students for exploring livelihood opportunities and understand the connection between theory and its practice in real life.The MSFC course is approved by National Skills Qualification Council as Job Role: Multi Skill Assistant Technician at 10th grade level and Multi Skill Technician at 12th grade level. This course delivered through ‘learning by doing’ method develops a holistic environment for both girls and boys to come together to learn skills such as electrical, soldering, carpentry, food processing, nutrition, gardening and nursery techniques. As a result, the students are able to get exposure to real life application of subjects like physics, chemistry, mathematics, geography, civics, and social science. The girl students, in particular, acquire unconventional skills otherwise considered as professions for male folks. Employers such as A V Elevators, have taken a step ahead and provided internship opportunities for girls, for the first time, in their industry and are now interested in offering these girls jobs on successful completion of the internship. Sonali Chavan is a 11th standard student of Rajiv Gandhi E-learning School, Pune. She belongs to a conservative lower middle-class family and is a first-generation learner. She resides at Indhira Nagar and her father work as coolie with local contactor in the fabrication sector and her neighbors are no different. She has been taught that field like electrical and fabrication are man’s job since early age, but determined to overcome such limitations and pursue her passion in it, she enrolled herself for an MSFC course along her friends. Today, she is doing an internship in the electrical and fabrication domain and inching closer to make her dreams a reality. Supriya is 11 th standard students who belongs to lower economic background. She is one of the sincere student. She feels that MSFC is dream come true course. She has seen poverty since childhood wanted to earn to overcome it. But due to financial constrain she will not able to opt for any course after 12th standard to become self- dependent. She will be not be able study further that is the reason why Supriya focused on MSFC classes. She realized that MSFC trainer taught us fabrication, basic engineering, this will give opportunity to earn for fulfill her basic needs and save some money for her further education. Now, Supriya is one of the girls who’s doing an internship with AV Elevators. After completion, she will be working as an electrician and fulfill her dreams. This might just be her first step of success. Snehal ( Right side) is another MSFC student, who is also doing an internship with AV Elevators, Pune. She is in 11th grade. As an electrician intern, she assisted senior electrical to install elevators in two weeks. She was initially not interested in studies and never aspired to work for any company. But, MSFC seeded an interest into her as she’s now being able to taste her own fruits of success and experience the results of whatever she is working on,this eventually led her to develop an interest in electricals. Today, she strives to pursue further studies so that she can become an engineer. Posted byLend A Hand India June 19, 2018 September 20, 2018 Posted inUncategorizedLeave a comment on Multi Skill Foundation Course opens job opportunity for Girls in Elevator Industry!! Ms. Nirmala Kamble is – as most headmasters are – usually found in her office with the usual tasks for the day accumulating on her desk. She emits a different aura than the usual “strict headmaster”. Instead, she is approachable, easy to hold a conversation with, and has a camaraderie with her administration, all the while maintaining her authority. She has been headmaster of Baburao Sanas School for Girls in Mangalwar Peth, Pune since the 2015-16 academic year, and in her time she has inherited the challenges that face many Pune Municipal Corporation (PMC) schools today. It is her friendly disposition and her attention to individual student needs that is helping her handle issues that affect students’ education. The students that enroll in Baburao Sanas are from the surrounding underprivileged areas, where there are higher rates of drug and alcohol use, the effects of which they bring into the classroom. Ms. Kamble addresses this challenge with kindness and attention. She supports providing strong counselling services, holding parent meetings to keep them updated about their child’s academic progress, and encouraging teachers to give individual attention to each student. However, the halls are not as full as they’re supposed to be, and when the bell rings, there aren’t many students that spill out of classrooms. Ms. Kamble is also faced with the challenge of decreasing enrollment rates as private schools gain popularity in the area and already-established schools turn into English mediums. The PMC schools are all Marathi medium, and the effort to convert a few of them into English mediums has only recently begun. Baburao Sanas has also been, since its inception in 1971, an all-girls school, and so it sees fewer students than most other PMC schools. And so, Ms. Kamble plans to make it co-ed, in an attempt to increase enrollment rates. “We have 225 students and 7 teachers here. The numbers are decreasing, and keeping the school from closing is my biggest challenge and my goal,” she says. This is the unfortunate reality of many government schools that are being overshadowed by private institutions. And yet, the administration and staff of Baburao Sanas is deeply connected and devoted to ensuring that school doors remain open. “Baburao Sanas was the first PMC school to have a 100% result, in the 2002-3 academic year,” says Ms. Asha Yamgar, school coordinator, and she shows a plaque hanging with the 12th board exam result history on the wall in front of the headmaster’s office. She also discusses teacher involvement in surrounding communities, and says that the teachers conduct home visits to understand the students’ situations outside the classroom and urge parents to pay more attention to their education. Teachers especially look for bright students with a financial situation that will not allow them to pay for further education. For these students, the school tries to find sponsors. Ms. Kamble has her own connect with Baburao Sanas and her involvement with PMC schools goes back to her childhood. She went to Netaji Subashchandra Bose Madhyamik in Yerwada, and then became a teacher. She has worked for 32 years in the education field, 13 of which were spent teaching maths and science courses at Baburao Sanas. “It’s important that the students know that being at a PMC school does not mean that they can’t be something,” she says, and she is an example of this. The quality of education at these schools is perceived as low and, as a result, career options are believed to be limited. Ms. Kamble is working on changing this reputation and her main strategy is to strengthen the quality of education at Baburao Sanas by increasing the availability of school amenities that can help it compete with surrounding schools. She has especially pushed digitization and now, the school has four digital classrooms, two of which are computer labs. With pamphlets and boards listing these features and the various extracurricular activities that the school offers, Ms. Kamble and her staff reached out to the community in an attempt to increase enrollment rates. They visited various primary schools to speak to students and parents about the benefits of attending Baburao Sanas. Ms. Kamble is really hopeful that one of these features will increase enrollment. Since the integration of the multiskill and retail courses in the school, students have been enthusiastic about participating, and Ms. Kamble and Ms. Yamgar believe that this program will be of immense benefit to students from slum communities. The courses have been effective in not only in teaching rudimentary technical skills, but also in giving the students an ability to problem solve. The students were involved in fixing certain plumbing and electrical issues that the school had, and have been using the learnt skills at home as well. “The multiskill class may be a reason for a slight increase in enrollment in the last year, and we are one of the three schools in Pune that offer level 3 and 4 as well,” says Ms. Kamble. She hopes that once the first batch of level 4 graduates is employed in this field, they will spread the word about multiskill to other children in the community, and they will be motivated to enroll. Ms. Kamble’s ultimate goal as headmaster is to increase the number of divisions in each class. She hopes that the school’s efforts to stay relevant, especially with digitization and the multiskill and retail courses, will make an impact not only on the quality of education that the students are receiving, but on securing the school’s future as well. शुक्रवार, दिनांक २ सप्टेंबर रोजी कन्याशाळा सातारा येथे लेंड अ हँड इंडिया संस्थेच्या वतीने गणित शिक्षकांकरिता विशेष फेलोशिप प्रदान समारंभाचे आयोजन केले होते. गणित विषय अध्ययन अध्यापनाच्या नाविन्यपूर्ण व कल्पक पद्धतींचा प्रचार व प्रसार करण्यास प्रोत्साहन देणारी ‘गणित सारथी’ फेलोशिप सातारा जिल्ह्यातील ९ गणित शिक्षकांना प्रदान करण्यात आली आहे. विद्यार्थ्यांना गणित विषयाबद्दल वाटणारी भीती ही अनेकदा त्या विषयाच्या अध्ययन अध्यापन पद्धतीमध्ये लपलेली असते. शिक्षकांचे गणित अध्यापन आनंदी व्हावे तसेच विद्यार्थ्यांना गणित विषय शिकताना दडपण येऊ नये या उद्देशाने लेंड अ हँड इंडिया (लाही) संस्थेने सातारा जिल्ह्यातील ११ तालुक्यांतून ५५ शिक्षकांसाठी ‘सहज सोप्पे गणित अध्यापन’ प्रकल्प हाती घेतला. गणित विषय आनंददायी, अर्थपूर्ण आणि विद्यार्थ्यांच्या समजून घेण्याच्या पद्धतीला अनुकूल व्हावा हा या प्रकल्पाचा उद्देश होता. यामध्ये महिन्याच्या अंतराने सलग चार कार्यशाळा ५५ गणित शिक्षकांसाठी घेण्यात आल्या. चार कार्यशाळा पूर्ण केल्यावर सहभागी शिक्षकांना गणित विषयाच्या अध्यापनाचा जिल्ह्यातील सर्वच शिक्षकांना व विद्यार्थ्यांना उपयोग व्हावा या उद्देशाने ५५ शिक्षकांमधून ९ शिक्षकांची ऐच्छिक तत्वावर निवड करण्यात आली. या एक वर्षात प्रत्येक गणित सारथी शाळेमध्ये गणित उपक्रम करेल व निवडक पाच शिक्षकांना साधे सोप्पे गणित अध्यापन या विषयावर प्रशिक्षण देईल व शाळेतील गणितात चांगली कामगिरी करणाऱ्या तसेच ज्यांची गणितातील गती कमी आहे अशा पाच विद्यार्थ्यांना मार्गदर्शन करेल. स्वागत गीताने पाहुण्यांचे स्वागत झाल्यावर संस्थेच्या कार्यकारी संचालिका सौ. सुनंदा माने यांनी सर्वप्रथम लेंड अ हँड इंडिया या संस्थेचे कार्य व गणित सारथी फेलोशिप देण्यामागचा उद्देश स्पष्ट केला. त्यानंतर ‘एका कल्पनेची शक्ती’ या विषयावर त्यांनी उपस्थित शिक्षकांचे मार्गदर्शन केले. तसेच नियोजन आणि एक दृढनिश्चय आणि त्यासाठी झोकून देण्याची तयारी असेल तर आपण साम्राज्य उभे करू शकतो असे सांगून त्यांनी सुरुवात केली. १३ वर्षांपूर्वी लेंड अ हँड इंडियाचा प्रवास अशाच एका संकल्पनेने झाला; गुणात्मक माध्यामिक शिक्षण. कोणताही प्रकल्प उभा करायचा असेल तर किती खोलात जाऊन विचार करावा लागतो हे त्यांनी उदाहरण देऊन स्पष्ट केले. पहिली सात वर्षे कष्ट केल्यानंतर हळूहळू लेंड अ हँड इंडिया संस्था नावारूपाला येऊ लागली आणि आज देशाच्या ८ राज्यांमध्ये त्याचे अस्तित्व दिसून येते. भारतीय प्राचीन विद्येचे अभ्यासक आणि मुलांचा कलागुण व सर्वांगीण विकास या विषयांवर कार्यरत असलेले श्री. भालचंद्र पुरंदरे हे कार्यक्रमाचे प्रमुख पाहुणे होते. ‘चाणक्य – एका शिक्षकाचे चरित्र’ या विषयावर ते बोलत होते. ‘आजच्या जगात शिक्षणाचा उद्देश कुठेतरी हरवला आहे. झपाट्याने वाढणारे तंत्रज्ञान आणि ढासळणारे तत्त्वज्ञान या दोन्हींची सांगड घातल्यास माणसाला दिशा आणि सुख मिळू शकते. अशा या जगात शिक्ष क त्याचे सामर्थ्य हरवून हतबल होतो. ‘मी एकटा काय करू शकेन? जग बदलण्याचे सामर्थ्य माझ्यात आहे का? असे प्रश्न त्याला भेडसावत राहतात. या प्रश्नांची उत्तरे पाहण्यासाठी इतिहास चाळला तर डोळ्यांपुढे येणारे पहिले नाव म्हणजे विष्णुगुप्त अर्थात ‘चाणक्य’. इतिहासातील सर्वात रक्तरंजित काळात भारताला सावरणारा एक शिक्षक होता. केवळ ज्ञान आणि निष्ठेच्या जोरावर आपल्याला एक नव्हे तर तीन श्रेष्ठ सम्राट; सम्राट अशोक, चंद्रगुप्त मौर्य आणि बिंदुसार; बहाल करणारा एक शिक्षक होता.’ ‘शिक्षक सामान्य नसतो. निर्माण आणि प्रयोग हे त्याच्या मांडीवर खेळतात’. या शब्दात पुरंदरे सरांनी उपस्थित शिक्षकांना स्वतःचे सामर्थ्य आणि महत्व पटवून दिले. १९९१ साली प्रसारित मालिका ‘चाणक्य’ मधील ठराविक चित्रफिती सादर करून त्यांनी त्यांच्या व्याख्यानाला दुजोरा दिला. उपस्थित शिक्षकांनी त्यांच्या व्याख्यानाचे टाळ्यांच्या कडकडाटात स्वागत केले. यानंतर सातारा शिक्षण विभाग मार्फत उपस्थित असलेल्या श्री. महामुनी, उप-शिक्षणाधिकारी, सातारा यांनी त्यांचे मनोगत व्यक्त केले. ‘शिक्षकाला विद्यार्थ्याप्रती आपुलकी असेल तरच आपले सेवाव्रत पूर्ण होऊ शकते.’ लाहीच्या या नाविन्यपूर्ण उपक्रमाचे कौतक करत असताना ते म्हणाले, “लेंड अ हँड इंडिया संस्थेने त्यांच्या नावाप्रमाणेच आपल्याला मदतीचा हात देऊ केला आहे. त्यांनी हे ज्ञान आपल्याला उधारीवर दिले आहे. त्यांची परतफेड करायची असले तर आपल्यापाशी संकलित झालेले हे ज्ञान शक्य तितक्या लोकांपर्यंत पोचवणे ही आपली जबाबदारी आहे.” त्यांच्या सहज सोप्या भाषेतून महामुनी यांनी शिक्षकांना फेलोशिपचे महत्व अगदी थोडक्यात पटवून दिले. लेंड-अ-हँड इंडिया द्वारे सुरु करण्यात आलेल्या शिक्षण मंथन कार्यक्रमाची आठवी बैठक दिनांक २८ जानेवारी २०१६ रोजी आयोजित करण्यात आली होती. याकरिता प्रमुख वक्ते म्हणून पुण्यातील ‘स्वधा – अ स्टायनर्स स्कूल’ ह्या शाळेच्या संस्थापिका आणि मुख्याध्यापिका सौ. शेफाली कोस्टा ह्यांना आमंत्रित करण्यात आले होते. ऑस्ट्रीयन विचारवंत आणि तत्त्वज्ञ डॉ. रुडॉल्फ स्टायनर यांच्या तत्त्वज्ञानावर आधारित शाळा त्यांनी २०१२ मध्ये पुण्यात सुरु केली. Posted byLend A Hand India November 25, 2015 April 25, 2017 Posted inStories from the FieldTags: featured, Lend-A-Hand India, Maharashtra, MSFC, NSQFLeave a comment on New Beginnings..
लेंड-अ-हँड इंडिया द्वारे सुरु करण्यात आलेल्या शिक्षण मंथन कार्यक्रमाची पाचवी बैठक दिनांक २९ ऑक्टोबर २०१५ रोजी आयोजित करण्यात आली होती. प्रमुख पाहुणे म्हणून संतुलन संस्थेचे संस्थापक मा. श्री. बस्तू रेगे यांना आमंत्रित करण्यात आले होते.